Integrity, Responsibility, and Respect for the Game. Community Soccer is Now Accepting Team Applications! Community Soccer's 1st Ever Indoor Soccer Field is Now Open! Come Play! The building is located at 22761 B, Mule Deer Trail, Box Elder, SD 57719. *New renovations to the field have been made, updates will be posted soon. The beauty of soccer is that it is a players game, and ultimately, everything revolves around the players to preserve this beauty. Take away coaches, referees, and administrators; as long as there are players, the game still exists. Keep coaches, referees, and administrators, but take away players, and the game ceases to exist. So, put coaching aside. Here are three fundamental ways we can improve the game of soccer in the United States. 1. Encourage players to play with properly inflated soccer balls. 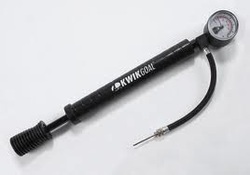 A ball pump with gauge is essential for any soccer person. Playing with properly inflated soccer balls allows players to get consistent touches on the ball, therefore improving their game and minimizing the frustration of striking a flat ball that produces inconsistent results. Quiz: What is the PSI for a properly inflated soccer ball? 2. Strive to provide players with a flat playing surface. Ball sitting in a sprinkler head hole. 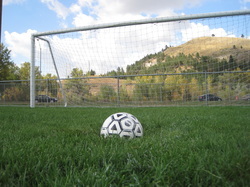 For the same reason as encouraging players to play with a properly inflated soccer ball, playing on a non-sloped, flat surface, free of divits, and sunken-in sprinkler heads, produces consistent results for players as they run and touch the soccer ball. Playing on a flat surface allows players to focus their attention on playing soccer rather than on the playing surface. Playing on a flat surface also minimizes the frustration of getting inconsistent touches on balls that bounce in unpredictable directions as they roll over divits and across sunken-in sprinkler heads. And finally, playing on flat surfaces lowers a player's risk of injury. Soccer itself is a contact sport with risk of injury. There is no need to add more risk with an improper playing surface. 3. Mark fields with straight, visible lines. Two center circles on one field. Having straight, visible field markings allows players to make good spacial judgements of where they are on a field, where the ball is, and where their opponents are. 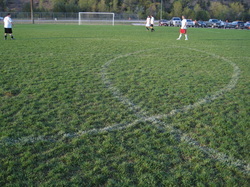 Having straight, visible field markings also allows players to focus their attention on playing soccer rather than on trying to figure out where field boundaries are. Another benefit to straight, visible field markings is that it allows referees to focus their attention on reffing, rather than on trying to guess if a ball is in-bounds, out-of-bounds, in the goal box, outside of the goal-box...etc. Placing importance on proper equipment and playing surfaces is a simple way we can preserve the beauty of the game, improve the soccer experience in our community, and help players develop properly.